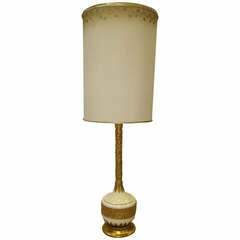 Italian Hollywood Regency ceramic lamps with a textured drip glaze in green and gold tones. 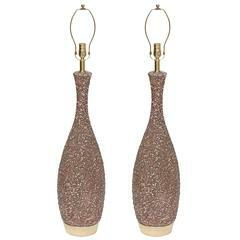 Each is mounted to a gilded wooden base. These lamps date from the 1950s and are in excellent vintage condition having wear consistent with age and use. The noted height is to the finial while the height to the top of the ceramic body is 19.5" (49.5cm). Each is fully restored with all new wiring and hardware, including a double socket cluster. Please note that the shade is for display only. 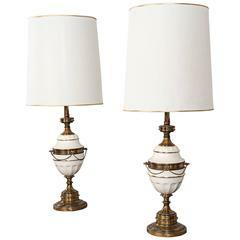 A pair of light green table lamps in two different sizes, in Hollywood Regency manner. Wired to US standards. In good vintage condition. Monumental Hollywood Regency glazed ceramic lamp. Original shade included. The ceramic portion of the base is 16 in. diameter x 26 in. tall. 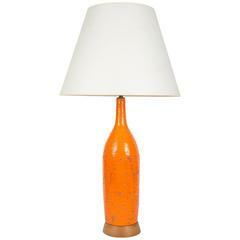 Pair of Mid-Century Italian cocoa and white Lava glazed lamps sitting on brass bases. Lamps have been rewired for the USA with brown silk cords.